A Norwegian zombie horror/comedy directed by Tommy Wirkola, Dead Snow for one half follows the clichéd horror staple of a group of teenagers alone in an isolated cabin getting picked off one by one by an initially unknown predator. The second half sees the film turn into a kind of goofy Bruce Campbell-esque bad-taste splatter parody / Shaun of the Dead zomcom mash-up. As a film it has a lot of charm but in trying to be all things to all men it's in danger of losing it's identity; anyway, I get ahead of myself. 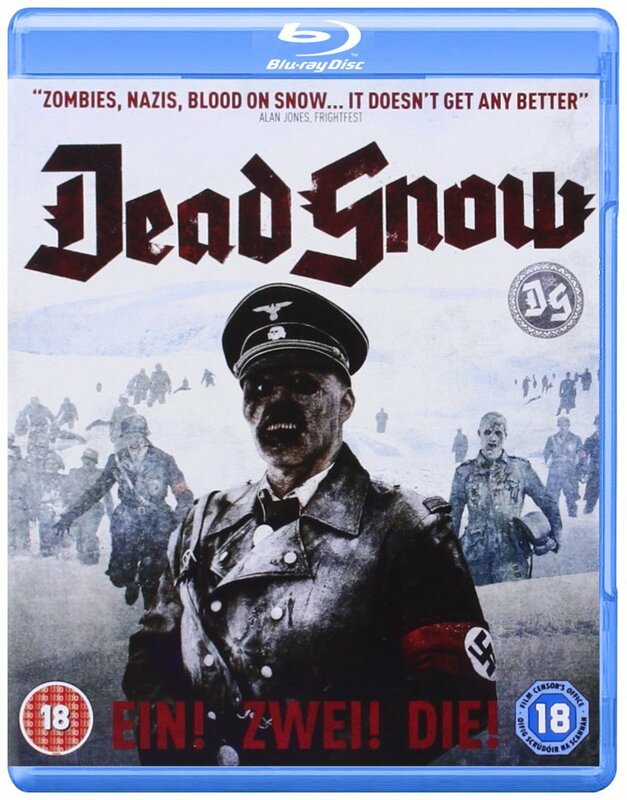 Dead Snow opens with a young woman getting chased across the icy tundra near Øksfjord, Norway, by a couple of snarling menacing nazi zombies, establishing early on as if we weren't aware from the cover what we'd be in for. The film then cuts to our seven plucky students off to an isolated frozen cabin retreat for Easter vacation lead by Vegard (Lasse Valdal) the boyfriend of who we now know to be the late Sara (Ane Dahl Torp). Arriving on foot the film makes great efforts to reiterate to us that they really are miles away from civilisation, that there really is no phone reception and that they really are isolated, which I think I got. The film does have the confidence to self reference this horror cliché, but a cliché it still is. First night in, cue a wise old hiker dropping by to tell them the uncomfortable and unsettling story of the region. How during World War II, a force of Einsatzgruppe, led by Standartenführer Herzog (Ørjan Gamst), occupied the area, abusing and torturing the citizens, and generally getting up to no good. At the end of the war attempting to abscond with the all the town's gold and valuables the townsfolk fought back en-masse killing many and driving the remaining soldiers with Herzog out into the tundra where the cabin now sits, to their icy death. So to the first half of the film. Our seven intrepid heroes in true horror fashion are slowly stalked with the outside toilet a prominent location throughout. It's also during these early scenes that the group discovers a box of the lost Nazi gold and jewellery and the focus for all their troubles. 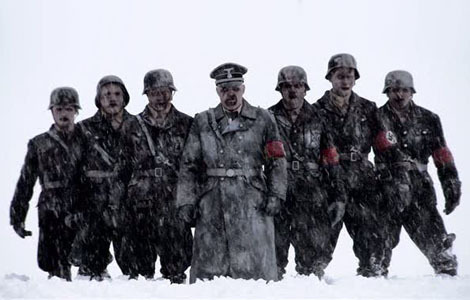 Firmly entrenched in Scandanavian mythology, the undead Nazis in Dead Snow are draugr rising from the dead to protect their treasures and if only the students had worked this out sooner they could have avoided all the hell that was about to break loose. So with 45 minutes on the clock and the group in full realisation mode that something really is very wrong, Wirkola starts to change the film's direction from a slow, jumpy tense horror thriller to an action centred zombie slaughter-fest starting with a full on siege of the cabin. So onto the second half of the film. With the siege over, our remaining shocked and scared survivors do what all good horror victims do and split up. Two head out for the car with two remaining behind to wait for Vegard who had left the group on his snowmobile before the trouble started to search for the missing Sara. Obviously with fresh snowfall obscuring the tracks back to the car the two girls heading for rescue get lost and consequently are chased all over the wasteland by the surprisingly fast and quite nimble zombies. The film is still quite tense and serious to this point but a scene where Hanna (Charlotte Frogner) wrestles a Raven to death giving her away her position up a tree signals the change of pace the film was about to make. After accidently setting fire to the besieged cabin with a Molotov cocktail, the two men, Martin (Vegar Hoel) and Roy (Stig Frode Henriksen) who stayed behind flee and find themselves in the heavily equipped tool shed that happened to be next door. Arming themselves up to the hilt with scythes, hammers and a chainsaw and with new found confidence they turn their attention to the incoming zombie waves. Here the film changes to the Bruce Campbell-esque comedy zombie splatterfest I mentioned in the first paragraph. The now seemingly less invincible zombie horde are cut down with swagger, precision and a lot of blood and it's during this full-on undead pagga that Martin gets bit and confident in his medical-student education answers the eternal question of how one would cut one's own arm off by severing it one-handed with the chainsaw and cauterising it in a freshly constructed small fire. Soon joined by the returning Vegard who has had quite the adventure of his own the group cuts, hits and shoots down the remaining undead under the direction of Herzog and then turn their attention to the leader himself. 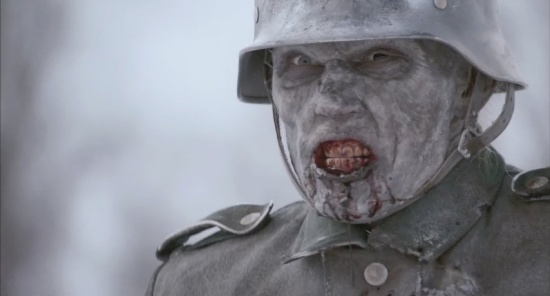 Distancing itself from the Romero zombie, the undead in Dead Snow are seemingly being guided and controlled by their old leader, the also undead draugr Herzog, who is him (it)self is driven by the re-acquisition of the stolen gold found and tampered with by the group. They mindless horde are able to use weapons, binoculars, and to a certain degree demonstrate cunning and guile. Whilst they also seem to able to work together in teams to attain their goals they're still also very much guided by zombie canon in that they are also driven by a desire for living human flesh and the only way to halt their progress is to destroy the brain. ...And what a lot of brains get destroyed. Despite obvious budgetary restrictions the zombie-gore comes thick and fast and Wirkola and his team have produced a polished production that never feels like a b-movie. It especially looks crisp and clean on Blu-ray and they've done a remarkable job putting to shame many big budget releases. With the screen constantly filled with hacks, slashes, disembowelments, gouging and brains, I'm not sure I've seen a film with so much red in quite some time and it's not a surprise to read that supposedly 450 litres of fake blood were consumed during filming. Those that like a good bit of over the top cringe-worthy gore won't be disappointed. 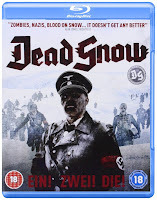 As I said from the off, Dead Snow is fun and enjoyable but struggles to establish a firm identity. It describes itself as a horror comedy and I'd argue for the first 45 minutes or so the laughter is thin on the ground with the focus on forging a tense traditional jumpy horror narrative. With a slow build-up the first true scares only come after many nerve-wrangling teases, and the comedy and genre parody only appears once the film is very much in its stride, very much like its Evil Dead inspiration., The acting, whilst not being particular memorable is strong throughout. As said, this is a revised review, of sorts, where I'm happy to hold my hands up. Wirkola has fashioned an incredibly well shot, intelligent play on the genre that still holds its own. With constant contemporary reference, yet memorable and original scenes it deserves praise of its own. Set against a beautiful crisp backdrop, it's absurd, scary, gory, and now 8/10.